These bills have to pass the Senate (which was designed to be a cooler, more deliberative body to counteract the rash, hot-blooded behavior from the other chamber to prevent laws being passed in the heat of the moment), then be referred to a committee to iron out the inevitable differences between the houses, and then be passed on to the President to sign. Pelosi never promised that their first 100 hours would actually mean anything. They were simply a gesture towards you. Your lives haven't changed. Your minimum wage hasn't gone up and the oil industry hasn't paid another penny in taxes (which, strangely, none of the oil companies owned by the Kennedy family will be required to pay). Everything is the same today as it was in October. The only thing that has changed is that it's the Democrats who will be leaning back to rake in the phat lobbyist monies that used to go the the Republicans. Time to cash in, baby! Yesterday we had our first full day at work since Sunday. The weather hit the high 50s, and last night's low was in the mid 30s. The area news stations are still predicting more snow, and highs in the 40s tomorrow. I'm not sure how we're gonna have snow in the 40s. I guess it's Global Warming ("Praise Gaia and her annointed prophet Al Gore! "©™ Hahhh-Men!). Already Global Warming faithful are dismissing El Niño as the culprit, insisting that it's their team that is responsible. Geez, it's like watching two groups of terrorists fight over who set off the car bomb: "It was me!" "No! He's lying! It was me!" Me? I'm just glad we're back to the seasonal temps. In 1984, Diane Duane's Star Trek novel My Enemy, My Ally was published by Pocket books. The novel introduced readers to the Rihannsu, and introduced us to the Romulan language. I have to confess that I read this book five or six times in 1985-1986. I still consider it one of the best Star Trek novels ever written. In 1987, she wrote (with her husband Peter Morwood) The Romulan Way , the story of McCoy's arrest and transport to Romulus, or ch'Rihan as it's called in this series. I didn't like it quite so much, but it actually had a Rihansu dictionary at the back! Thirteen years later, Duane returned to the series with a two-book continuation, Swordhunt and Honor Blade . The two book series apparently left the Romulans and Federation on the brink of war. I say apparently because it's been 6 years since I read the books. They were unsatisfactory, at best, and were meant to be a continuation of The Romulan Way. I have completely forgotten what went on in the two books. Finally, in 2006, 22 years after this series began, Duane deigns to finish her story in The Empty Chair . So far, I'm not terribly impressed. Duane is an excellent writer, but her habit of referring to Captain Kirk as Jim is annoying. I can't think of another writer who has done that, and this makes her books jarring when compared to the rest. The book opens as Ael and Jim prepare for war. We are dropped in with the expectation that we will know what is going on, and why. I'm halfway through the book, and there has still be no recap of the previous books. I could have tolerated it six years ago, but now? I'm hoping Duane's skills will allow me to enjoy the book, but I'm not too optomistic. 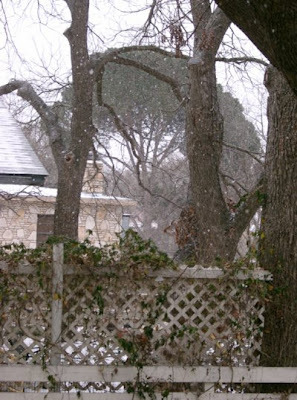 We seldom get snow in the Hill Country. Usually we get ice and sleet. Yesterday, we got both. It was sleeting when I went to work at 7 am. By noon, the sleet and snow was still coming down, so the boss closed the office. By the time I got home, flakes the size of dimes were falling. It lasted about an hour before it started sleeting again. Mike Buday would like to take his wife's last name, Bijon, and has sued the State of California to make it easier for men to do so. Only six states -- Georgia, Hawaii, Iowa, Massachusetts, New York and North Dakota -- have statutes establishing equal name-change processes for men and women when they marry. In California and other states, men cannot choose a different last name while filing a marriage license. This is a growing trend, mainly because people have different views on gender equality than they did in the past. In Milwaukee County, Wisconsin, the County Clerk estimates that 1 in 100 men take their wife's name. Diana Bijon has no brothers and would like to see her family name continue. Buday, on the other hand, is estranged from his father, and isn't attached to his name. This is a bigger deal in Japan than it is here. In the mid-80s I was an exchange student in Isahaya, Japan and had a homestay family in Sasebo, the Yakabes. Mr. Yakabe had taken his wife's family name to keep it alive. He had brothers to continue his name. Texas-based pizza chain Pizza Patron, has found itself the object of hate mail a death threats from peace loving whites and English-firsters. What inspires such hatred of a hispanic owned business? Why, signs reading "Aceptamos pesos"--or "We accept pesos"--at its stores across Texas, Colorado, Arizona, Nevada and California. A Pizza Patron spokesman said all they were trying to do is sell more pizzas to its hispanic customers, who make up 60% of their business. I saw one interview on San Antonio news and a native-born (but hispanic and therefore second rate and suspect) citizen said, "This is great! My grandmother keeps sending me money from Mexico. Now I can spend it!" The chain usually locates its stores in Hispanic neighborhoods and requires its managers to be bilingual and to live in the area. The company proudly proclaims: "to serve the Hispanic community is our passion." Please note that there were no death threats against the stores along the Canadian border that take Canadian dollars, thereby proving that the English-firsters and peso haters don't object to accepting foreign currency from a white country.